To find the Disk Defragmenter, click on Start and go to All Programs -> Accessories -> System Tools. 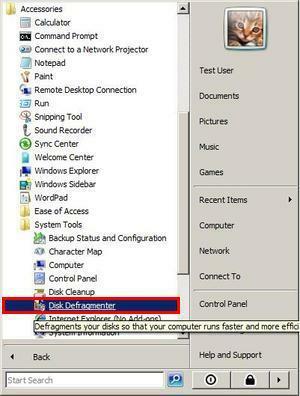 Then, click on the Disk Defragmenter shortcut. 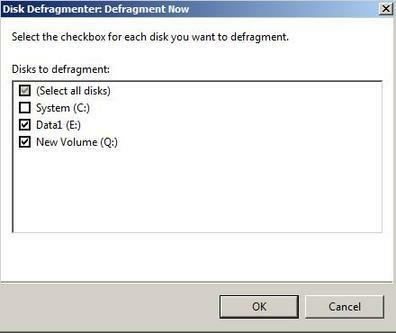 An alternative is to click on Start, type 'defrag' in the search box and click on the Disk Defragmenter shortcut. When starting the tool, you will receive an UAC prompt and you will have to enter the administrator password or to click Continue. 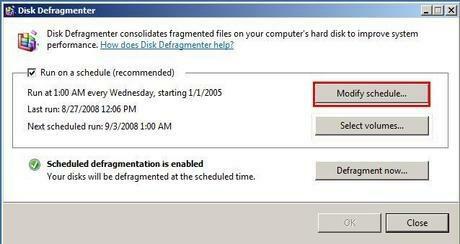 To start the defragmentation process right away, click on Defragment now. 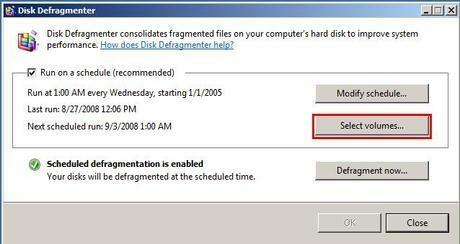 Now, select the partitions you would like to defragment and click OK.
First, click on 'Select volumes...'. You can select one disk, more or all disks to be defragmented. When done, click OK. 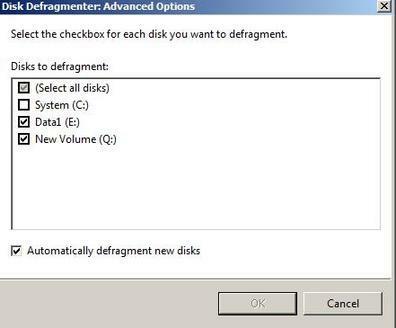 If 'Automatically defragment new disks' is enabled, then any new disks that are added to your computer will be included in the defragmentation schedule. 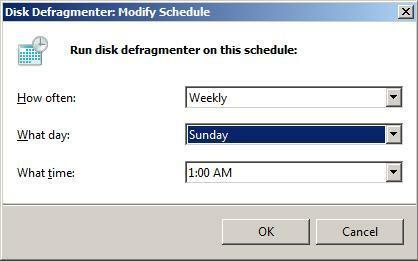 To modify the schedule time of the automatic defragmentation process, click on the 'Modify schedule...' button from the Disk Defragmenter window. The best time to schedule the defragmentation is during the night when you do not use your computer, but any time is ok because the defragmentation process is configured so that it will have little impact on your running programs. 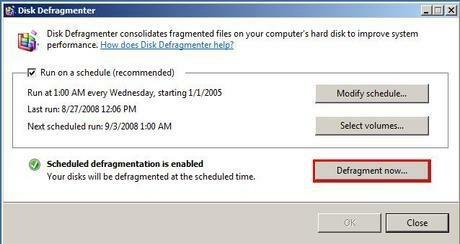 You can select how often the defragmentation will be run: Monthly, Weekly, Daily. Depending on the frequency you have selected, you can set the the 'What day' field to the day of the month (between first and last day) or the day of the week (Sunday to Saturday) when the process should run. In the 'What time' field, you will have to select the exact hour when the process will start. When done, click on OK. If you think that the defragmentation process takes too long, you can run the Disk Cleanup just before starting the Disk Defragmenter. It will clean unnecessary files thus speeding up a bit the defragmentation process. One thing that helped to speed up the defragmentation time in Windows XP was to have 15% or more free space on the partition you wanted to defragment. As a result of the changes implemented in the Windows Vista version of this tool, there is no longer any need to have a minimum of 15% free space. However, the more free space you have, the less data you need to defragment, and so you will lower the time it takes for this process to be finished. Also, before saying that it takes too long to defragment your partitions, you should keep in mind that Disk Defragmenter uses low-priority disk access and CPU usage so that it doesn't influence your current running programs. This automatically translates into a slower process. The good thing about it is that, if you don't run any resource hungry applications, you won't feel any negative impact on the performance of your PC while the defragmentation is running. I have read many places that the new defragment tool uses less resources and does not impede performance. My question is has anyone tested this? If so, could a link be provided. I'm also curious, is the defragmentation as efficient if I am running Microsoft Word while the tools is running as it is when no applications are running? Good question. It is worth doing some testing to measure the real performance impact. Will include this on the list of ideas for future articles. Thanks! Until we will do some exact measurement here is how you can have an look at your own System and see that the defragmet tool uses less resources. You open Windows Task Manager and Resource Monitor, then you start Disk Defragmenter. You will see at the processes in Task Manager the process DfrgNtfs.exe You can right click on it, go to Set Priority and you will see that in the time of the Deframent the Priority is set by default to Low. The second thing that you can view is in Resource Monitor at the Disk window. Here you can see that the Defrag.exe has the IO Priority set to Low. I think this can help you in understanding the resources utilizations. Are there any plug-in options available to those users who truly miss having the menus that show you the defragmenting process? I was having serious performance problems with recorded videos on a 2TB external drive running in a RAID 0 configuration until I discovered that the drive was highly (make that HUGELY) defragmented. I had assumed that Vista defragmenter was automatically defragging that drive, and it was set to do so. But without any kind of drive map or disk analyzer in Vista defragger it's nearly impossible to check the drive for fragmentation or tell if it was defragged at all. Now I'm using the freeware Auslogics defrag to fix the drive -- it looks like it's going to take about a week to finish. I would argue that Vista's "Defrag Lite" is totally inadequate for today's terabyte-sized hard drives. I agree. I started out with 65GB before the defrag - now i only have 55GB. Where has the 10GB went ? I waited over 4 hours on the defrag and then went out to the shops and there was no clue as to when the damned thing was gonna finish ! I am currently running a disk defrag on my laptop because my cpu usuage gets high most of the time which makes the laptop turn it'self off. i have gone through all the other norton checks such as, disk check. will a disk defrag help lower the cpu usage?